Review by AllTheBestFights.com: 2016-10-15, fight not particularly good between Christian Hammer and Erkan Teper: it gets two stars. The undefeated Erkan Teper entered this fight with a boxing record of 16-0-0 (10 knockouts) and he is ranked as the No.8 heavyweight in the world (currently the #1 in this division is Wladimir Klitschko). He has fought once in 2016 beating Derric Rossy (=Teper vs Rossy). His opponent, Christian Hammer, has an official record of 19-4-0 (11 knockouts) and he entered as the No.25 in the same weight class. He suffered his last loss when he faced Tyson Fury last year (=Fury vs Hammer), after this bout he has won over Sherman Williams and Michael Sprott. 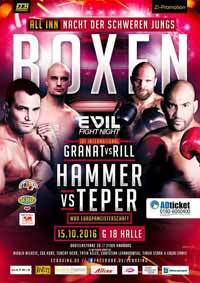 Teper vs Hammer is valid for the vacant WBO European heavyweight title. Watch the video and rate this fight!